An Argentine composer born January 2, 1943 in Cordoba (Argentina). After studying at the National University of Cordoba (Argentina, 1959-1962) and also with Juan Carlos Paz in Buenos Aires, Horacio Vaggione acquainted himself with French electro-acoustic music through the radio and began to compose his first works (Ceremonia for tape, 1961). He took charge of the electro-acoustic studio of the Centre for Experimental Music he had founded at the University of Cordoba (1965). During the 1960s he visited the principal European electro-acoustic studios and experimented with digital sound synthesis as a scholar of the Fulbright Fund (1966) at the University of Illinois. In 1968 he joined Luis de Pablo in Spain and set up the group Alea. A composer-researcher at the University of Madrid (1969-1973) and then in various universities in North America (1974-1977) and Europe (from 1982), Horacio Vaggione was in residence at Ircam (Fractal C, 1984; Thema, 1985), at the DAAD in Berlin (1987-1988), before becoming lecturer at the University of Paris VIII (1989) and then research director at the École Doctorale Esthétique, Sciences et Technologies des Arts at the University of Paris VIII (1993). His output consists mainly of electro-acoustic compositions (Octuor, 1983; Préludes suspendus III,2009; Points Critiques, 2011), mixed music (Tar, 1987; Taléas, 2004) and purely instrumental music (Tahil for piano, 1992). Horacio Vaggione includes computer technology in his compositional processes, developing ideas of stratification, figuration, articulation, morphology and singularity. Horacio Vaggione was born in 1943 in Moldes in the province of Cordoba in Argentina. He studied the piano and music theory before entering, in 1955, the Alessio de Cordoba Conservatory. From 1959 to 1962 he continued his apprenticeship at the Arts School of the National University of Cordoba with Olger Bistevins (harmony and orchestration), Carlos Gasparini (counterpoint and organ), Cesar Franchisena (musical form), Juan Carlos Fernandez (history of music) and Ornella de Devoto (piano). At the same time he followed public classes at the faculty of philosophy and studied serial composition techniques composition with Juan Carlos Paz in Buenos Aires. He also appeared as a pianist, performing works from the classical and contemporary repertories from 1960 to 1963. In 1961 he undertook his first work in electro-acoustic music at the CIAL, the acoustics research centre of the Institute for mathematics and physics of the University of Cordoba (Ceremonia for tape, 1961), then installed an electro-acoustic studio in his home. Through a technician friend at the Radio, he obtained tapes from the RTF (French radio/television) and so familiarised himself, from the early 1960s, with the music of Pierre Schaeffer, Bernard Parmegiani and François Bayle. He also produced some radio broadcasts on contemporary music (National Argentine Radio, 1961-1962). In 1964, Horacio Vaggione undertook his first trip to Europe (France, Germany, Spain). In Paris he visited the Groupe de Recherches Musicales (GRM) and met Pierre Schaeffer. He also discovered the latest works of Iannis Xenakis and attended, in Germany, the summer courses at Darmstadt. With an award from the Fulbright Fund (1966), he visited the universities of Columbia, Princeton, Yale, meeting Milton Babbitt, Morton Feldman and John Cage. He followed a computer music course with Lejaren Hiller and Herbert Brün at the University of Illinois. Lejaren Hiller introduced him to the work of Max Mathews on digital sound synthesis and gave him the computer programme codes that then enabled him to start his own work in this field. In Argentina, already a member of the Association of Young Composers of Argentina (AJCA) since 1962, he joined the Acousticians Group of Latin America (GALA). In 1965 he cofounded the Centre for Experimental Music (CME) at the National University of Cordoba, taking charge of the centre’s electro-acoustic studio. In 1966, after the coup d’état of Juan Carlos Ongania, a state of siege was made permanent, civil and social rights and freedoms were suspended. Censorship was omnipresent and any avant-garde cultural movement was banned; tanks surrounded the university and Horacio Vaggione could no longer work. In a letter, Luis de Pablo then proposed, in Spain, the creation of an electro-acoustic studio financed by a patron and encouraged the composer to join him. In 1968 he settled in Madrid, spending four years in Spain. With Luis de Pablo he founded the group Alea – musique électronique live (1969-1973), together with an electronic studio an a ‘Music and computing’ project at the Autonomous University of Madrid (1970-1973). He worked at perfecting a system of sound synthesis and composed his first digital works. Modelos de universo III represents his earliest experiments with granulation and digital micromontage. Unfortunately, l’ETA kidnapped the patron who had enable them to carry through their project and the adventure came to an end. After a stay in North America (1974-1977), Horacio Vaggione settled in Paris. 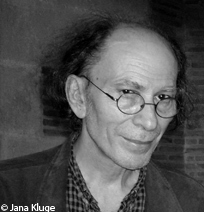 In residence at Ircam (1982-1985), he composed Octuor, premiered at Bourges in 1983, Fractal C (1984), Thema (1985), first performed by Daniel Kientzy and won a prize at the Bourges Competition for Electro-acoustic Music. In 1987-1988 he was in residence in Berlin as part of the DAAD Berliner Kunstler-Program, worked at the Electronic Studio of the Technische Universität and took part in the summer courses in Darmstadt (1988) giving lectures on computer-assisted composition. In 1983 he presented a doctoral thesis entitled Poly-phonies : critique des relations et processus compositionnels to the music department of the University of Paris VIII. He subsequently taught in this department, was appointed teaching head of the electro-acoustic studio, then manager of the SIM computer music system, a research laboratory that later became the CICM (research centre for computing and music creation), of which he became director in 1995. In 1989 he was appointed lecturer in ‘Computing and music creation’ at the University of Paris VIII, then in 1993 he became research director at the École Doctorale Esthétique, Sciences et Technologies des Arts at the University of Paris VIII. Vaggione’s catalogue includes works ranging from pure instrumental to electro-acoustic music as well as mixed and interactive works. All show the same approach: an interest in morphology, in the integration of computing, the transposition of digital concerns to the instrumental level. His music is characterised by lively, often violent colours, but also by subtle relationships that are set up between the acoustic instruments and the recorded or computer-generated part (Thema for bass saxophone and tape-computer, 1985), through the exploration of the meaning of the material used and its potential, as well as on the symbolic significance of the musical figures (Septuor for electronic ensemble, 1981). The composer has specialised in micromontage, granular synthesis, as well as micro-sounds and microtemporality (Nodal, 1997; Arenas, 2007). For Horacio Vaggione, composing is equivalent to the generation of veritable, unique events and their articulation within ever greater ensembles without the meaning of this unicity being lost. He considers that every sound object is a musical object and lies within the domain of the composable; he likes to take sound objects produced by acoustic instruments and transform them: Ash (1990) is an example of this, using the Syter process of the GRM; similarly, Points critiques (2011) is based on the sounds of a snare drum (rubbing, bouncing, multiphonics) transformed by a whole range of software. His works bridge the chasm between sound and structure by developing a multi-scaled temporal approach, achieved through networks of objects conceived as polyvalent symbolic entities. Horacio Vaggione has been a laureate of the Newcomp (prize for computer-assisted composition) in Cambridge in 1983, Trimac in 1985 and the Bourges prizes of 1982, 1986 and 1988. He is a holder of the Euphonie d’Or (Bourges, 1992) and received the ICMA Award of the International Computer Music Association in 1992. In 2010 the Ton Bruynèl Prize was awarded to his work Préludes suspendus III (2009), ex æquo with Crystal Counterpoint by Åke Parmerud​. Sauf mention contraire, les partitions de Horacio Vaggione sont inédites. SOLOMOS Makis (dir.). Espaces composables : essai sur la musique et la pensée musicale d’Horacio Vaggione. Paris : l’Harmattan, 2007, 352 p.
SOLOMOS Makis, SOULEZ Antonia, VAGGIONE Horacio. Formel/Informel, musique-philosophie. Paris : l'Harmattan, 2003, 261 p. (Collection Musique-Philosophie). VAGGIONE Horacio. L’espace composable, sur quelques catégories opératoires dans la musique électroacoustique. In : L’espace : musique-philosophie : [actes du colloque international, Université de Paris-Sorbonne, 27-29 juin 1997] / [organisé par le] Centre de documentation de la musique contemporaine [et le] Groupe de recherches en poïétique musicale. Paris : l’Harmattan, 1998, p. 153-166. VAGGIONE Horacio. Décorrélation microtemporelle, morphologies et figurations spatiales du son musical. In : Espaces sonores : actes de recherches / sous la direction d’Anne Sédès. Paris : Editions Musicales Transatlantiques, 2003, 144 p.